Most of us default to email (or text or IM) as our preferred way to communicate. We can have some pretty compelling reasons for that sometimes. There are lots of benefits; you don’t want interrupt someone if they’re in the middle of something, or you can make sure you haven’t forgotten to say anything before you hit “send,” or you’re in a hurry and think email will be faster, etc. But while email may be preferred mode of communication, it’s not always the best. In fact, it can be downright detrimental to your purpose. There are certain times and circumstances in which you should never send an email and should opt for a calm phone call, or better yet face-to-face sit-down. Angry emails may make you feel better – for a little while – when you send them, but they usually wind up not being worth it in the end. If you say something you wind up regretting later, you can never get it back. The person you sent it to will have it always, and you never know who they might forward it to. Nastygrams can spread and not only hurt your relationship with the recipients, but also damage your reputation if they get around. If something is important enough to make you angry, it’s important enough to be handled verbally after you’ve had time to process the situation and cool down. 2. If you’re trying to take the easy way out of an uncomfortable situation. If you ever choose to use email because you want to be able to say something unpleasant or controversial without having to face anyone, don’t do it. These are exactly the situations where email works against you the most. For one thing, your reader will sense that you’re scared to say something face-to-face and may lose a certain amount of respect for you. Beyond that, you actually increase the probability that they will argue against or just disregard what you have to say. If you must communicate something that someone might disagree with you about, going verbal is more important – and more effective – than anything written, especially emails. Written communication actually diminishes your chances of convincing anyone of the merits of your statements. It’s been said that 80% of communication is visual, so written statements rob you of the ability to soften your tough words with a kind face, tone, or gestures. As a business leader or manager, you are occasionally called upon to convey information that someone isn’t going to like. You will only make the situation worse by transmitting your message solely in writing. 3. When you need to be efficient or need something quickly. Besides being counter-productive, using email for everything can be a big time-waster. We spend huge amounts of time trying to do things by email that could be accomplished much more quickly by phone. 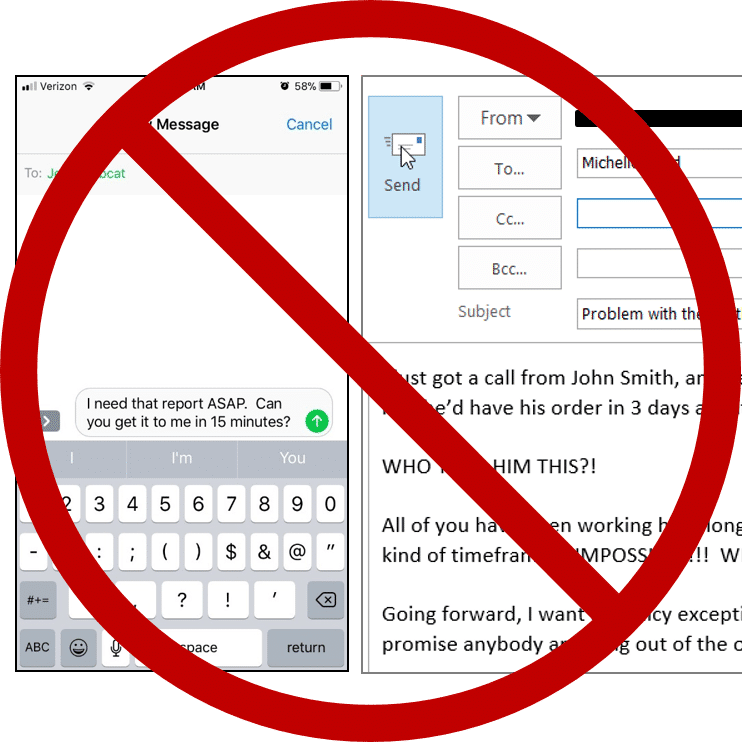 Something as simple as scheduling a meeting between two people can take a whole day (or more) and a dozen emails back and forth, when the two parties doing the scheduling could book the meeting in 5-10 minutes if one of them would just call the other. If you need something done within 30 minutes, callorgo see the person. If you need something done within two hours, text the person. If you need something done within the workday, IM the person. If you need something done within the next couple of days, email the person. Personally, I might double these times. Face-to-face communication is best because it allows you and the people you’re communicating with to more accurately read each other’s state of mind. It allows you to pick up on the message the other actually wants to convey without reading in a tone or an attitude that wasn’t actually intended. Let’s remember that verbal communication – real voices, real faces, real telephone calls – lets the human in you come through. And that’s more powerful than any words read on a screen.